Proper horse hoof care is an important part of horse ownership – and unfortunately, can be an aspect of equine management that is easy to overlook. Similar to a human foot, the primary functions of a horse’s foot are to bear weight, absorb shock and provide traction. Inadequate hoof care reduces the foot’s ability to perform these functions, and consequently increases the amount of stress put on the horse’s joints, tendons and ligaments which can cause further mobility and overall health issues. All horses need regular hoof care to ensure good mobility and comfort, but not all horses require shoeing. But, there is much more to healthy hooves than trims and shoes. While farriers and veterinarians are vital to the health of all domesticated horses, hoof health is driven by a variety of factors, including nutrition, environment, wound and injury prevention and care, and cleaning. This means that sound hooves begin with the horse’s owner. They are the person most able to influence a horse's lifestyle and, thus, the horse’s hoof health. A horse’s hoof can be divided into two main parts – informally known as the sensitive foot and the insensitive foot. This differentiation helps to illustrate that there are parts of the hoof that have feeling, and parts that do not. The insensitive foot, which does not have blood vessels or nerves, protects the sensitive foot that does. Beyond that, a horse’s hoof is composed of three main parts – the wall, sole and frog. The wall is the part of the hoof that is visible when the horse is standing. The wall is a keratin-based exterior that covers the front and sides of the horse’s third phalanx, or coffin bone. The hoof wall is made up of the front toe, side quarters and heel, providing a hard, protective layer around the internal (sensitive) parts in the foot. The hoof wall is covered with material that prevents evaporation of moisture – called periople. It is the most outer layer of the hoof that forms a protective covering on the hoof wall and is responsible for regulating moisture. When the horse’s foot is lifted off the ground, the sole and frog are visible, as well as the bars of the wall and the collateral grooves (which are where the frog meets the hoof wall). The frog, a highly elastic wedge-shaped mass, is an important part of the structure because it normally makes contact with the ground first. 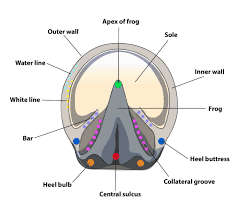 The wall and frog are the weight-bearing structures of the foot. The wall of the hoof, which does not contain blood vessels or nerves, is composed of a horn-like material that is produced continuously and must be worn or trimmed off. In the front feet, the wall is thickest at the toe; in the hind feet, the hoof wall is of a more uniform thickness. New layers of the hoof’s wall start just below an area called the coronet, which is the where the horse’s skin meets the hoof wall. A lot weighs on a horse’s hooves. And, things like weather, environment, routine, shoes, heredity and nutrition can all affect equine hoof care in their own way. This means there’s more to healthy hooves than trimming and shoes. This is why proper hoof care does not solely rest on a farrier or veterinarian and should be seen as a necessary part of a horse’s daily management. While this information is not intended as a substitute for advice from a professional farrier or licensed veterinarian. Research shows that veterinarians typically recommend diligent, daily hoof care. Daily hoof care helps owners notice early signs of thrush and other infections as well quickly find and address puncture wounds, cracks, abscesses, and anything else out of the ordinary. In addition to proactive care, the frequent removal of dirt, bedding, and mud is much faster – and, most importantly, healthier for both parties when done daily. Clean out hooves daily, before and after all trail rides, pasture work, or turnout. Remove dirt, rocks, grass, manure, and more with a hoof pick. Follow with a stiff-bristle brush to clean away debris from the sole, which should be visible at all times. Learn how to remove a shoe. Check for sprung (pulled away or bent) or shifted (moved to the side) horseshoes to avoid injury from the metal shoe or its clinches or nails – keep a suitable hoof repair kit on hand for added protection. Talk to a trusted veterinarian about tailoring each horse’s diet to their individual nutritional needs. Because the hoof wall consists largely of keratin, a structural protein, a horse’s diet must contain enough high-quality protein to supply the amino acids essential for hoof growth. Avoid feeds containing excess sugars and starches as they can increase a horse’s risk of laminitis. Consider adding a hoof supplement to the horse’s diet. Most contain vitamins and minerals, such as biotin and zinc, which help maintain and encourage the growth of proteins and keratin that comprise a horse’s hooves. Maintain moisture to avoid soft or brittle hooves. Control hoof water loss and absorption with a sealant or topical conditioner. Clean the horse’s stall or pen regularly to avoid standing in manure. Level pastures and fill in holes to help prevent water from gathering and forming mud. Provide a run-in shelter to offer the horse protection and dry ground while turned out to pasture. Exercise helps promote hoof growth, strength, and health. Turnout plus regular riding is ideal for a horse’s overall wellness. Read our Keratex Hoof Hardener review here. Horses hooves are trimmed and shod to maintain their overall balance and integrity. On average, a horse’s hoof grows 3/8 of an inch per month. Regular farrier visits should be scheduled according to a horse’s individual needs. Although four to eight weeks is the average, ultimately there's no standard interval for trimming and shoeing. For example, if working on correcting a problem, shorter intervals may be more beneficial. In young foals, weanlings, and yearlings, frequent hoof trimming will assure proper weight bearing and bone alignment. Foals should be trimmed for the first time at one or two weeks of age. Not all foals are born with perfect hoof and leg structure, and even for those that are, hoof care needs to start at an early age to maintain correctness. If there are signs of deviations, corrective trimming can help correct and/or minimize leg and hoof deviations if done within the first year of age. Mature horses also need regular trimming to maintain soundness. Proper shoeing is basically proper trimming (hoof wall and sole preparation) with the addition of a shoe of some type, applied for added hoof protection. Proper shoe application includes fitting a shoe to a properly trimmed and shaped hoof, not fitting the hoof to a generically shaped shoe pattern right out of the box. Shoes may be steel, aluminum, plastic and/or various components of these. Shoes are usually nailed on with the proper size of nail, but may also be glued on. Before shoeing, the hoof must have a balanced trim. A correct size of shoe must then be shaped for proper fit and attached. Correctly sized shoes should extend around the circumference of the shaped hoof wall long enough to cover the heels, but not so long as to provide an opportunity for the heel of the shoe to be stepped on or pulled off. The shoe should be adequate in width and length for the size of horse and the horses primary use. If your horse has a leg or hoof injury, your vet will likely want you to use a medicated mixture and a horse soaking boot. Age – In general, younger horses’ hooves tend to grow faster than older horses. Climate – Hooves grow slower in cold, winter months. Nutrition – Horses that are not getting an adequate intake of their necessary nutrition will grow less hoof in comparison to a horse receiving optimal nutrition. Environment & Exercise – While horse hooves generally grow at a constant rate while temperatures are above freezing, horses kept in soft pastures will tend to have longer hooves than horses kept in rocky or harder terrain because they will experience less natural wear. The same rule applies to exercise, well fed and well exercised horses will tend to have healthier hooves than those that are kept in a stall with little or no exercise.